Tomatoes are a vine fruit native to South America, and like the potato and eggplant, are members of the nightshade family. By the time European explorers arrived in the New World, tomatoes had made their way up from Central America and Mexico. The Spanish brought plants back to Spain, but it took some time for the fruit to be accepted as it was considered, as were many nightshade plants, poisonous. Some considered the fruit an aphrodisiac, and the French called them "pommes d'amour" or "love apples". It wasn't until the 1900s that tomatoes became popular in the United States. Today, the fruit - commonly referred to as a vegetable - is considered a favorite amongst Americans. There are dozens of tomato varieties in various sizes and colors. The most common found in American supermarkets in the beefsteak tomato, a large and bright red fruit. Other popular varieties include plum or Roma tomatoes, cherry tomatoes, yellow pear tomatoes, etc. 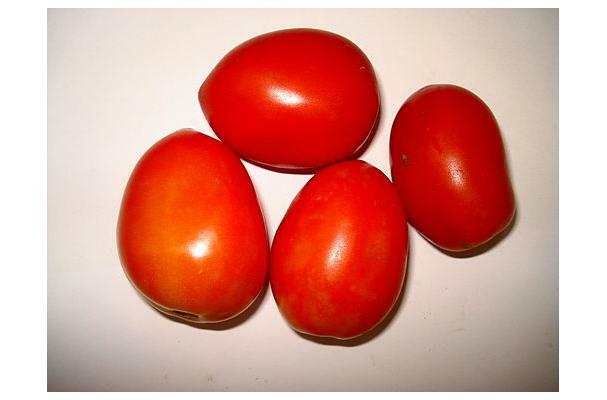 Tomatoes can be heart or egg shaped, they can be round or oblong. Depending on the variety, the color and flavor can vary from sweet to tart and from bright green to brilliant red. Choosing: Choosing tomato is a little bit tricky. First of all, tomatoes comes in group, not individually wrapped so you have to pick them one by one. Look for a heavy tomato with smooth skin. Do not pick those with soft spot for those are signs of rotting. Do not pick ones with holes because it means that worms got faster than you. Try also using your sense of smell before anything else. Fresh, ripe tomatoes smells sweet and good. If you smell a foul odor on a certain tomato, remove it away at once. Buying: You can buy tomatoes from your nearest grocery store, a farmer's market or your local market. Tomatoes can be simply sliced and eaten. They can be cooked down into a paste or sauce. They can be chopped and added to salsa, roasted or broiled and pureed. Cleaning: Clean fresh tomato with running water. Do not apply soap for it may leave residue that can stay on the surface of the skin. After the Spanish colonization of the Americas, the Spanish distributed the tomato throughout their colonies in the Caribbean. They also took it to the Philippines, from where it spread to southeast Asia and then the entire Asian continent. The Spanish also brought the tomato to Europe. It grew easily in Mediterranean climates, and cultivation began in the 1540s. It was probably eaten shortly after it was introduced, and was certainly being used as food by the early 1600s in Spain. The earliest discovered cookbook with tomato recipes was published in Naples in 1692, though the author had apparently obtained these recipes from Spanish sources. However, in certain areas of Italy, such as Florence, the fruit was used solely as a tabletop decoration before it was incorporated into the local cuisine in the late 17th or early 18th century. History: The tomato is native to South. Genetic evidence shows the progenitors of tomatoes were herbaceous green plants with small green fruit and a center of diversity in the highlands of Peru. One species, Solanum lycopersicum, was transported to Mexico where it was grown and consumed by Mesoamerican civilizations. The exact date of domestication is not known. The first domesticated tomato may have been a little yellow fruit, similar in size to a cherry tomato, grown by the Aztecs of Central Mexico. Aztec writings mention tomatoes were prepared with peppers, corn and salt. The word tomato comes from the Aztec [Nahuatl] tomatl, literally "the swelling fruit". This might very easily be my favorite 'ingredient' page! <a href="http://www.freewebs.com/tadabros ">tadalafil 20 mg</a> is available in a scribbling way that should be consumed only <a href="http://www.webjam.com/tadababa ">cheapest tadalafil</a> with the help of extravagantly <a href="http://flavors.me/tildo">tadalafil price</a> should be old at least 30-45 minutes first be thrilled by making and the <a href="http://www.tadabalbes.com">order tadalafil</a> effects of this prescription can be in the know on a <a href="http://tildimildi.webs.com ">tadalafil</a> longer period of beforehand that is benefit of verging on 36 hours.